A highly regarded Cardinals outfield prospect died in a violent accident as he was on the verge of fulfilling his potential with the big-league club. The tragic story of Charlie Peete is chillingly similar to that of another star-crossed Cardinals phenom, Oscar Taveras. On Nov. 27, 1956, four months after he had made his major-league debut with the Cardinals, Peete, 27, was killed in an airplane crash in Venezuela. His wife and three children also died in the crash. Fifty-eight years later, on Oct. 26, 2014, five months after he had made his major-league debut with the Cardinals, Taveras, 22, was killed in a car crash in the Dominican Republic. His girlfriend also died in the crash. Like Taveras, Peete was a potent left-handed batter. Playing for the Cardinals’ Omaha affiliate, managed by Johnny Keane, Peete was the 1956 batting champion of the Class AAA American Association. Like Taveras, Peete was planning to play winter ball and then report to spring training as a strong contender for a starting spot in the Cardinals’ outfield. 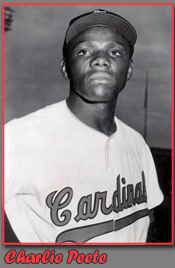 In July 1956, Peete was promoted from Omaha to the Cardinals. Hampered by a split thumb, he hit (10-for-52) .192 in 23 games for St. Louis and made 13 starts in center field. Peete had his batting average above .250 before going into an 0-for-13 tailspin that led to his being sent back to Omaha. He finished the minor-league season with a .350 batting mark, winning the American Association hitting crown. The runner-up was Yankees prospect Tony Kubek (.331). Accepting a chance to play winter ball in Cuba, Peete signed with a Cienfuegos team that included Senators pitchers Camilo Pascual and Pedro Ramos. Peete expected to spend the winter in Cuba, but he slumped early and was released. The Valencia team in the Venezuela winter league wanted Peete. He could have flown from Cuba to Venezuela to begin play. Instead, Peete chose to return to the United States to meet his wife, Nettie, and their children, Ken, Karen and Deborah, and bring them to Venezuela with him. At 10 p.m. on Nov. 26, the Peete family boarded a commercial flight at Idlewild Airport in New York. The plane was scheduled to arrive in Caracas at about 7 a.m. on Nov. 27. The flight was late. At 8:05 a.m., the French pilot, Capt. Marcel Combalbert, 34, radioed to the control tower that he was preparing his approach to the seaside airport. It was raining and foggy. Clouds limited visibility. About two miles from the airport, the four-engine Constellation slammed into a 6,000-foot mountain top. All 25 people _ 18 passengers and seven crew _ on board were killed.